Hey, young bloods! Today I'll be doing Snazzy Snippets, a link-up for writers where you share snippets from your WIPs! Today's snippets will be from Shadows from the Future (formerly titled The Adderwood Wand), the first book in my fantasy quartet. So sans further ado, let's get into the snippets! 1. A snippet that was difficult to write. "Do you know what all this ruckus is about?" Nirdawen asked with an artificial, tinkling laugh, taking a sip from her wine glass. "All I know was I was dragged out of my spa an hour ago! Like they expected me to be satisfactorily presentable within an hour." The jewels woven through her hair clinked as she shook her head. "That's why I don't look my best, I'm afraid." "Ah," said Horatio. "Well, you rarely do." 2. A snippet you had a lot of fun writing. On the outside Crisaya appeared royal and regal, but on the inside she was one stubbed toe away from a temper tantrum. 3. A snippet you plan to significantly delete/revise. "What do you mean, they're gone?" he asked the clerk in disbelief. "I mean they're not available for public perusal, is what I mean," replied the clerk at the courthouse, going back to writing on a piece of parchment and totally ignoring Philip. "It isn't a difficult concept, My Lord." "But - but that's impossible. They were there yesterday." Actually, Philip had no idea if the papers had been there yesterday. However, he'd learned over the years that the more sure you were of yourself, the more likely others were to obey you. "Yes, they were here yesterday," acknowledged the clerk, looking up at Philip irritably. "But they're not here today." "Not here, or just not available for examination?" "Both," replied the clerk. "Sergeant Casimir Talonstone took out those papers yesterday. I don't know what he did with them, and it isn't my business to know." "Don't you know what was in them?" asked Philip desperately. "I file hundreds of these sorts of documents each week, My Lord," the clerk replied dryly. "That you think I take the time to read every one of them is darling." Well, that's all for today! Which snippet was your favorite? 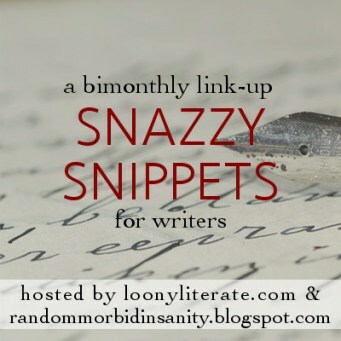 Are you participating in Snazzy Snippets? Comment below, and remember that you are all very beautiful pickles. Is this from the fantasy series that you've told me about, or is this a different one? Either way, I really like the second snippet; it very much shows just how irritated the character is without doing any of the (somewhat cliche) various words that basically mean irritated. Love the first one! That last line is gold. And 2 is awesome. Such a great way to describe the feeling. Topic 3 sounds like a scary one to share. Not looking forward to that one when I post my snippets! Thank you so much! I know right, it was really hard to settle on one. These are great, the first one made me laugh!